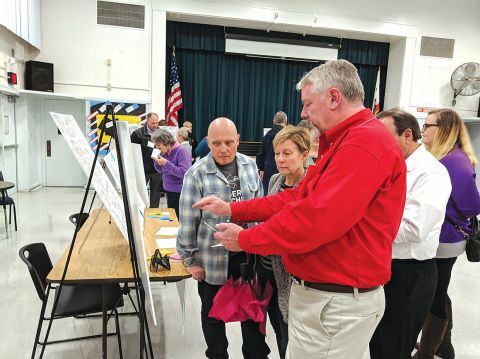 Dave Mitchell, district administrator for Sunrise Recreation and Park District, answers questions about how the Electric Greenway Trail Project will connect the parks in Citrus Heights. 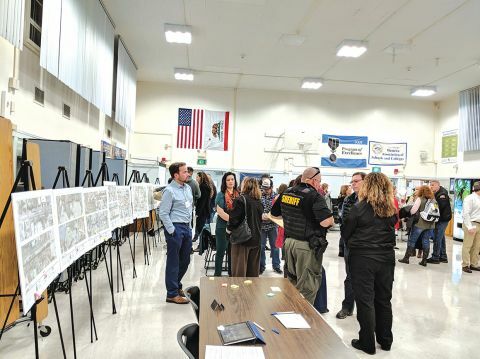 Many local residents attended an Open House for the Electric Greenway Trail Project, hosted by the City of Citrus Heights at the Sunrise Tech Center. The project is a partnership between the City of Citrus Heights, SMUD, Sacramento County, San Juan Unified School District, Sunrise Recreation and Park District, and Orangevale Recreation and Park District. The goal of the project is to highlight the natural beauty of the area while providing a safe, paved area for pedestrians and bicyclists. The trail will run between Sunrise Blvd. to the west and Wachtel Way to the east. It will connect many of the parks and nature area in Citrus Heights, including Arcade Creek Park Preserve, Tempo Community Park, Sundance Nature Area, Streng Avenue open space, Northwoods Park, C-Bar-C Park, Woodside Oaks Park, and Olivine Dr. open space. Jerry and Linda Lemon like the idea of the trail project, and Linda said “I’m 100% in.” She explained that riding her bike in the City currently requires her to pass through some areas where she doesn’t feel safe, and she believes the Electric Greenway Trail will create a safer environment for local recreation. “It will promote physical activity and family activity,” she said. Sergeant James Evans of the Citrus Heights Police Department said that some residents are concerned that the trails will increase the transient population in the area or encourage illegal activity, but he explained that similar trail projects have not found that to be true. Evans said that many local residences already have hidden dirt trails behind their properties, and that open trails with wide paved areas, bright lighting, and lots of foot traffic will actually discourage criminal activity. And Officer James Garing said that the trails will be wide enough to allow access for police cars, ambulances, and fire trucks—so emergency services will be able to more quickly address any issues that might occur. The project is still in the preliminary planning phases and environmental analysis is currently underway. Construction is expected to commence in spring of 2021 and be completed in 2022.